I found the sweet little image and printed it off in black & white to suit the theme of the hussif. A little bit of lace, a string of beads & a red button completed her (oh, and there's a teeny little silver heart too). Today your quote is from Willie Davis...."If you step on people in this life you're going to come back as a cockroach"
First, thank you for all the input and suggestions re my question about tablets. They were much appreciated! With the help of #2 Son, there is a 'Samsung Galaxy Tab 4' on the way...there's also something called a 'wireless router' that arrived at my door this afternoon. I suppose that now means that there will be another great learning curve happening at Chez Magpie! Scary thought. The long seam to the left of the scissors has been completed - there might be something happen yet to break up that long expanse, but will wait & see how it looks overall when the rest is done. I also added a second sewing machine (cross stitch on waste canvas). I see that Jennifer Clouston has a new crazy quilting book out (and of course you know it's on my wish list!!). If you'd like to know more, there's a review HERE. There's a cute free pattern for crocheted hearts HERE (hey, they're non-fattening and SO much better for you than Valentine's chocolate....yeah, and if you think I believe that one, you're sadly mistaken!!). Kathy Shaw has just opened registrations for her free ICQC-103 (Embroidery Motifs) online course and you can read more about that HERE. If you happen to have one of those brass lighting fixtures floating about (or you stumble across one in a thrift store) there are some really great ideas HERE for re-purposing them. I'd like to do a couple of these projects but will have to keep my eye out for lamps. Finally, here's your quote for today, from Richard Flournov & Lewis Foster...."There are two kinds of people: those who don't do what they want to do, so they write down in a diary about what they haven't done, and those who haven't time to write about it because they're out doing it"
Old family photos that have been hidden away in a box for years (and years!). 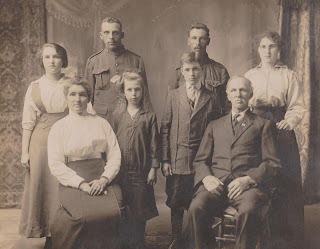 I've been busily scanning them into Ancestry and then bundling them up to pass along to various family members. It's a massive job, but fun to see them. From this experience, I cannot stress enough the importance of labeling your pictures with names and dates!!! Future generations will thank you. Yes, you know who the people are, but will your grandchildren know? There are so many wonderful old pictures that I'm throwing away, simply because there is no way to identify them. 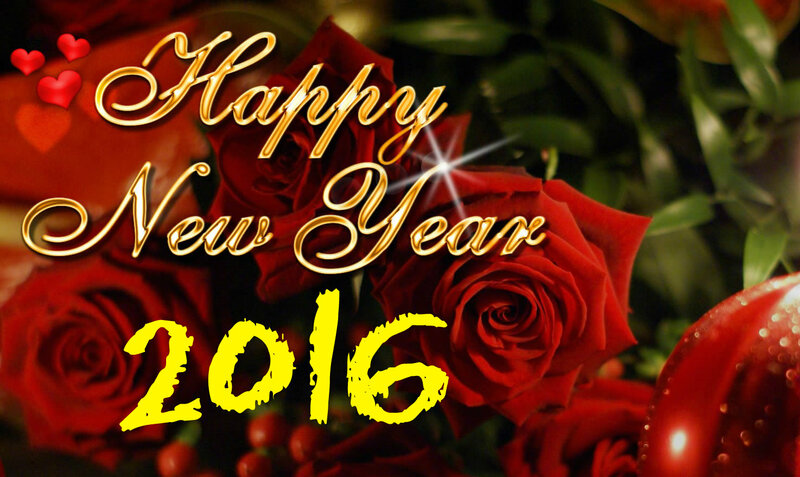 So...how be you make it your project for 2016 and get those pictures out and label them? I challenge you! 1. 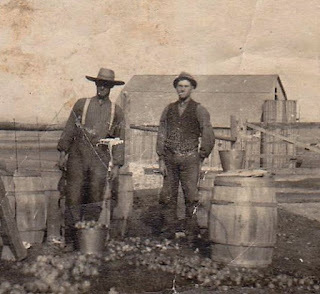 Pam Kellogg is searching for articles and pictures for the 'Crazy Quilt Quarterly' magazine that have old family photos and family history. Do you have an heirloom crazy quilt? 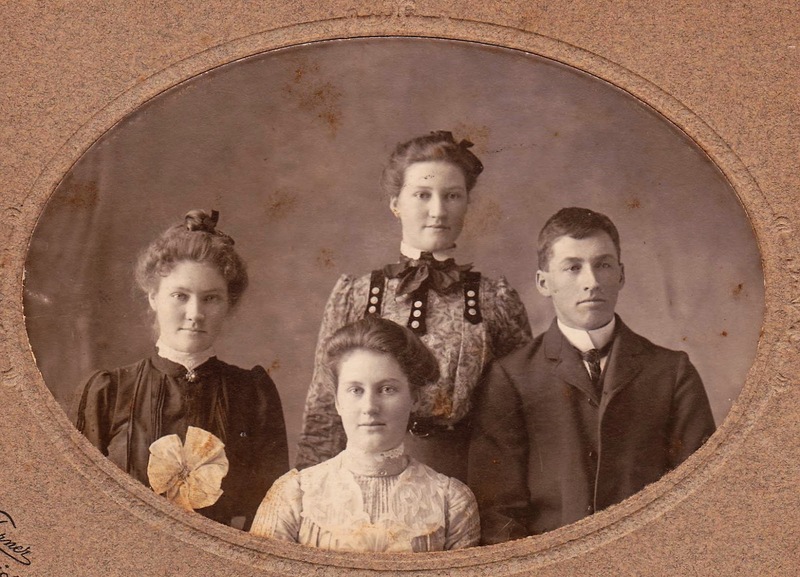 Have you done a project using old family photos? We want to see them! Please go HERE and read more about it. AND, that's not all! Pam is also releasing a book that's chock full of eye candy! I can tell you that it's a beauty and I can't wait to get my copy so I can be inspired. It will be available in mid-February. I'll let you know the purchase details as soon as they become available. Today the quote is from Margaret Lee Runbeck...."Happiness is not a state to arrive at, but a manner of traveling"
I've had several requests for my go-to pattern for the baby blankets and a search on the internet to find it was unsuccessful, so I will simply type it up for you. It's pretty easy! UPDATED TO ADD: My friend, who originally shared this pattern with me, just let me know that it originally appeared on the ball band for Phentex Worsted yarn. Thanks MEK! It calls for two 400 g balls of baby worsted weight yarn (I used Softee Baby by Caron); and a 6 mm crochet hook. Gauge isn't important for this project. NOTE: I buy three balls of yarn so I have enough for a nice border. FOUNDATION ROW: 1 sc in 2nd ch from hook; 1 sc in each ch to end of ch. Turn (127 sc). ROW ONE: Ch 3 (counts as dc); 1 dc in first sc. *Miss next 2 sc. (1 dc, ch 1, 1 dc) in next sc. Rep from * to last 3 sc. Miss next 2 sc. 2 dc in last sc. Turn. ROW TWO: Ch 1. 1 sc in each of first 3 dc. *1 sc in next ch-1 sp. 1 dc in each of the next 2 dc. Rep from * to last dc. 1 sc in top of turning ch. Turn. Repeat last 2 rows until work from beginning measures 48", ending with a 2nd row. This, in itself, makes a pretty baby blanket, but I like to give it a really nice border. Sometimes I find one in a pattern book that I like and I use that, other times (as in the blanket I showed you yesterday) it gets made up as I go along and also depends on how much yarn I have to use up. Another of my friends is happily expecting a new grandbaby in the spring and being that the father of the baby practically grew up in our house, I simply have to make sure the wee one has some special things. This is crocheted, using my now favourite go-to pattern (thanks MEK!!) for the main part and an out-of-my head border. There's enough yarn left over to make a wee little sweater and perhaps either matching bootees or a hat. it seems Blogger is having 'issues' and won't let me. You might want to check this site out. The artist makes simply amazing felted animals and birds. Today your quote is from Abraham Sutzkever...."If you carry your childhood with you, you never become older"
I have finished the seam at the bottom with the addition of some beads, and also added the vine (not complete yet) that flows across the middle. It's hard to see in the picture but those round 'things' are actually buttons with tiny little flowers on them. The heart was added simply as a nod to the inclusion of a little bit of red. My time over the past week or so has been divided into working on the hussif and also scanning (and uploading to Ancestry) a bunch of old family photos. It's a time-consuming process but it's fun to see the old pictures of family members, many of whom are long gone. Once I upload them, I'm then sorting them into family units and passing the originals on to those that might want to have them. Part of the clearing out process that's ongoing at Chez Magpie! If you want to see something absolutely incredible have a look at THIS. Be sure to scroll down to see it all. Absolutely stunning!! Today your quote is from that infamous 'Anonymous'...."When you have more than you need, build a longer table, not a higher fence"
I added the buttons on the left and am working on the zig-zag seam (below the spools of thread). It's not finished yet, and unfortunately the bling that is those little round 'beads' doesn't show up in the picture. They sparkle like diamonds in real life! Question for those of you who own tablets - I'm considering getting one and would like some pointers as to what features I should be looking for (and what features I should avoid). I know absolutely nothing about such things so I need all the help I can get!! There's a fun-sounding year-long mystery quilt sampler project happening HERE. There will be two patterns released each week and sounds like there will be fun giveaways and such throughout. I'm not a sane quilter (as regular readers will well know!! ), but if I were, I'd be signing on for this. Further on quilting - if you're wanting to use up scraps, you might want to check out Judy's post HERE where she gives lots of fun links to some great ideas. And for those of you who would like to learn more about piecing curves go HERE. Knitters who also like colouring might like the free knit & crochet themed colouring pages available HERE. Today the quote is from William James..."The deepest principle in human nature is the craving to be appreciated"
Guess what? Oh no - mumblings again! 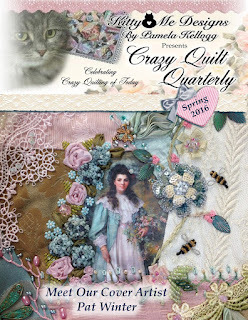 Today has pretty much been spent working on an article for the summer issue of the 'Crazy Quilt Quarterly' magazine, so I have no pictures I am allowed to show you. So, guess what I'm going to do? 1. There's what's shaping up to be a cute free block of the month quilt (called 'A Touch of Fun) just started. You have to download the pattern each month (and I think you have to sign up for their newsletter - which isn't hard!). Go HERE for more info. Looks like a great stash buster! 2. If you happen to like Cookie Monster, here's a free pattern to make one for yourself (or a little one). And the designer also has a free pattern for Elmo too! 3. And for those of you who are Star Wars fans, how about a free pattern for a BB-8? Oh, and if you like coloring how about the links HERE for tons of Star Wars themed pages? Some of them might be fun for embroidery too. 4. 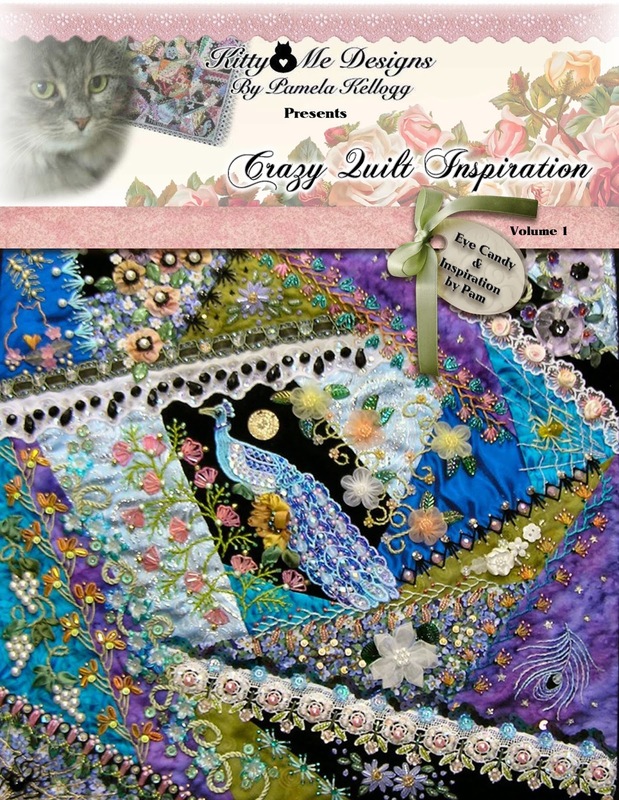 I am a bit late telling you about this, but Kathy Shaw has opened registrations for her free Basic Crazy Quilt online class and you have until midnight tonight to register. More info HERE. Well worth taking this class!! 5. There's a fun article HERE for making paintbrushes out of household materials. It's geared towards kids, but why should they have all the fun?? 6. Mary Corbet has done a review on the cutest little mini embroidery hoop frames that would be perfect for framing little embroidery pieces (perhaps for Christmas ornaments?). It can be found HERE. Gotta love Maxine! Now, here's your quote for today, from A.A. Milne.... "One of the advantages of being disorderly is that one is constantly making exciting discoveries"
I have always had a fascination for artisan glass - ever since I was a young teenager and looked forward to a visit to our local fair where I would get to watch a glass-blower at work. I even saved my allowance for months so I could buy a piece of his work. Remember the glass swans that you filled with coloured water which would then raise and lower in the swans' neck according to the atmospheric pressure? I loved it! This piece was a gift from one of my friends and how I wish I could have watched how they made it! The base is a piece of driftwood and the glass was melted/formed over the wood. Here you can see the two pieces. Obviously there are no two alike. The glass isn't 'perfect' either - there are bubbles in it, which only add to the charm! Today your quote is from the infamous Anonymous... "The happiness of your life depends on the quality of your thoughts"
I've stitched another couple of areas on my hussif. Sorry about the picture quality but the light here is not good (dull skies and more snow threatening). all done using waste canvas. - if you are a quilter, you may find THIS interesting. It explains how to cut pieces of varying shapes and the proper amount of seam allowance to add. - for those of us who use a lot of thread and would love to be able to purchase it in the large cones but then don't know how to use them with our sewing machines, there's a great tutorial HERE. This is absolutely brilliant!! - there's a wonderful sewing room organizer tutorial HERE. - Gerry has a great post on her blog about colour choices in your work and that can be found HERE. - There's an amazing crazy quilt honouring the veterans from the Vietnam war and it can be seen on Allie's blog HERE. 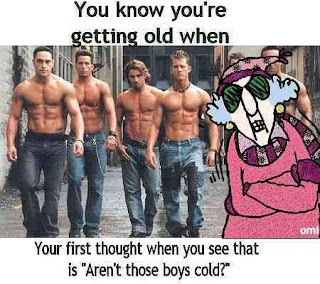 - for your laugh of the day, go and have a look at the picture Mary Ann has posted HERE. I think we can all relate!! 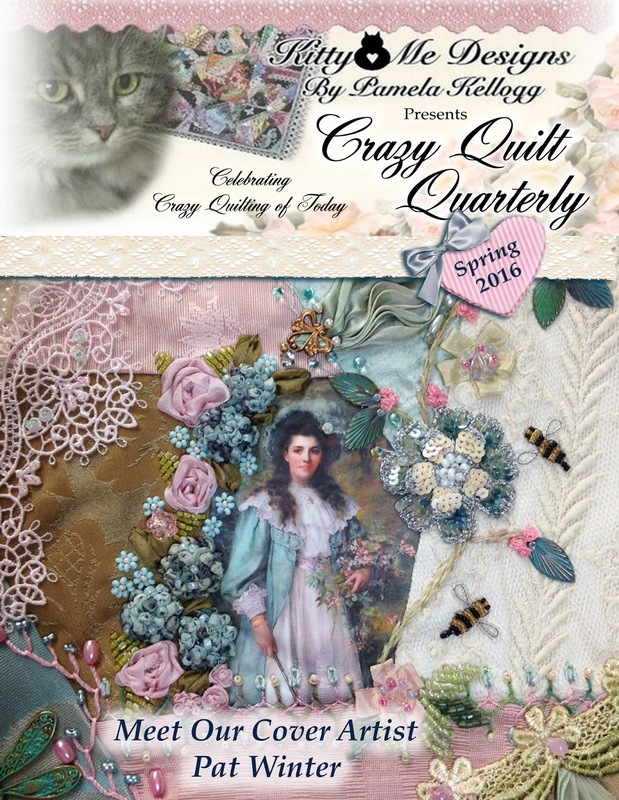 - just a gentle reminder that the editorial staff of the 'Crazy Quilt Quarterly' magazine are looking for submissions for both the summer issue of the magazine AND also for entries into the contest for the 2017 calendar. I'm one of the judges (and also the one you send pictures of your entries to) and I'm happily anticipating seeing what you create. The calendar needs entries for all months of the year, so you can choose whatever seasonal theme you might like to create. If you are looking for ideas for your calendar entry, have a look at the submission guidelines on Pam's site. Pam is also looking for advertising content for the summer issue. Go HERE for submission guidelines; HERE for information re the calendar contest; and HERE for her notice regarding advertising. Remember, we don't need your actual items so you won't have to worry about postage costs. Just send us good quality pictures! Today your quote is from Richard Bach... "The simplest questions are the most profound. Where were you born? Where is your home? Where are you going? What are you doing? Think about these once in awhile and watch your answers change"
Over the weekend I stitched a couple more areas on the latest hussif. I know I've repeated a scissors motif, but it's really difficult to come up with enough different designs that pertain to the sewing theme. I figure that we all own more than one pair of scissors and so I can get away with it! Above is our balcony railing. *just* see a bit of our snow-covered car. Today your quote is from Carl Reiner.... "A lot of people like snow. I find it to be an unnecessary freezing of water"
There has been a little bit of progress on the latest hussif. The area where you see the words will be 'enhanced' with some buttons I think - will wait and see what it ends up needing. Or not. Having a plunging good time? Good time? Nope, not so much. Woke up this morning to a clogged drain in our bathroom sink...joy. After a trip to the store for various and assorted potions (supposedly guaranteed to 'unclog even the toughest blockages'...hah), seven hours, and a second trip to the store to replace the overworked plunger, we had success. Would have been nice had it been nice enough to give us warning so we could have dealt with it before it became a problem. Plunging, and draining, means no stitching!! However, I do have some stitching to show you today anyway. I've started working on another hussif (I know, I can hear the collective groan from here). This one is black with white stitching (and a teeny little bit of red here and there), and I'm trying to come up with as many sewing themed patterns to use on it as I can. Today I'm linking up with SuperMomNoCape's stitchery linkie party HERE. Today your quote is from Alice Walker... "No person is your friend who demands your silence, or denies your right to grow"
Because I've been being a bit social the past couple of days, it means that there hasn't been much happening on the stitching front. After Christmas I started working on another hussif and I do have some progress to share, but pictures didn't get taken early this morning and now it's too dark. Fingers crossed for tomorrow! I've noticed many people are posting about their creative plans for the year and so thought I'd mention a couple of things I have planned (b'sides, if I say it here, then I'm committed, right?). As I said above, I've started on another hussif, which I'm sure you are getting heartily sick of seeing, but oh well. I'm obsessed. What can I say? My 'big' project over the winter is to tackle my pile of 'white' fabric bits and bobs that are taking up a large corner of my sewing room. The plan (if you can call it that!) is to throw down a queen-sized thrifted sheet onto my living room floor and then throw bits and pieces of my white stash in the same general direction with the thought in mind of then pinning them down, adding some bits of lace here and there, and then stitching the lot down with my machine. Sort of like an over-sized crazy quilt, but without the hand embroidery. I have two sheets - one plain and the other has a beautiful lace trim (that one will become the backing). Rather doubt there will be any sort of batting because I think it will be quite heavy enough as it is. Now the questions arise....will my aching knees survive all the crawling about on the floor AND will it end up looking like anything OR something the dog barfed up. Stay tuned.... (or not, depending on how brave you are). 1. 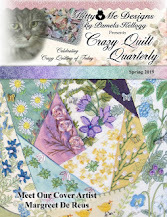 Pam Kellogg has put out the call for submissions for summer-themed items for the 'Crazy Quilt Quarterly' magazine. She is looking for anything you might have created with a summer theme and/or articles and how to's. Please do send in pictures of what you've done and consider writing a small article about your crazy quilt creations. We would all love to see! You can go HERE for further information. 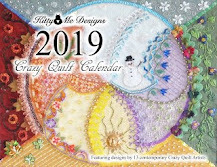 Please don't forget the 2017 crazy quilt calendar contest too! We are anxious to see your lovely creations so remember to check out the submission guidelines HERE and get your needles busy!! And here's a little teaser of the cover art for the spring issue (available Feb. 1st). I can happily tell you that it's another winner! 2. There's a nice tutorial HERE for making mittens out of old recycled sweaters. 3. If you go HERE you can find a handy chart for needle size conversions & uses and if you go HERE there's a chart telling you how many triangles, hexagons and diamonds you can get from fabric yardage. 4. There's a tutorial here for making the cutest little birds nest (out of wire). I think it would be perfect on a crazy quilt piece too!! The quote today comes from an unknown origin... "The only person you are destined to become is the person you decide to be"